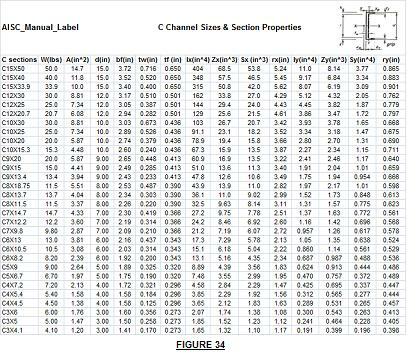 Steel c channel or structural steel channel varies in sizes from 3 to 15 inches deep, see figure 34 below. These structural steel channel sizes shown are very similar to how wide flange table works but are different from steel angle tables. Angle iron is used for light framing such as roof and floor openings. Larger angles of legs 5 inches or more are used for lateral braces as in braced frames or horizontal braces for floors. For loads that are too heavy for steel angles, but too small for wide flange beams, steel channels are normally used. The section properties in the table below are used by both architects and engineers to design steel channel sizes necessary to carry the design loads. To demonstrate how the design tables are used, lets verify the C8x11.5 used in the patio cover shown figure 26 below. In this design, the design load was estimated to be 15 psf dead load and 20 psf live load. First: check the C8x11.5 at mid span of roof deck. This C8x11.5 is 14 ft long. From moment equation M = wL^2/8. The tributary width is 8 ft (4ft from either side of the C8) so w = 35 psf x 8 ft = 280 plf. Substituting w to the M equation yield M = 280*8^2/8 = 2,240 lb-ft. The modulus equation S = M/.66Fy = [2240*12/1000]/.66*36 = 1.13 in^3 which is much smaller than the S = 8.14 for C8x11.5, see figure 34. Second: check the C8 at the column. In this case the span is 16 feet, the tributary width is 14 feet (7 feet from either side of the column). w = 35 psf x 14 ft = 490 plf, M = 490*16^2/8 = 15,680. S = [15680*12/1000]/.66*36 = 7.92 in^3 which is less than 8.14^3, the design is ok. Unlike I beams, both C and MC channels are made from A36 steel. There are some channels that are A572 grade 50 but they are more expansive. If your plans calls for grade 50 steel make sure your quote from suppliers reflect the grade 50 steel. To see pdf of miscellaneous channels sizes click here.